Artwork for Super Mario Advance. Tryclyde, also known as Triclyde, is a large, three-headed snake capable of breathing balls of fire. He is also an inhabitant of Subcon, the land of dreams. His design is based on the mythical Lernaean Hydra, a giant, multi-headed serpent. 1.4 The Super Mario Bros. Super Show! 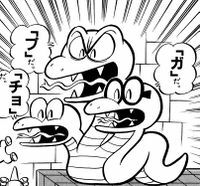 Not much of Tryclyde's past is revealed, though it is mentioned that he was originally an outcast; he was recruited by Wart due to his "cunning brain and offensive capabilities which are three times normal strength". In Super Mario Bros. 2, Tryclyde acts as the guardian of World 2 and World 6. Upon sighting the player, he shoots fireballs at them. In order to injure Tryclyde, the player needs to throw three Mushroom Blocks at him, which are resistant to Tryclyde's fire breath. After being hit by three Mushroom Blocks, Tryclyde is defeated. In this incarnation, he is red with black stripes or wrinkles. Only the front two heads actually move and spit fire; the back one stays still and only reacts to getting hit. While Tryclyde reprises his role in the version of Super Mario Bros. 2 included in Super Mario All-Stars, he is only the boss of World 2 in the Super Mario Advance port, having been replaced by Mouser as boss of World 6. His color changes in the remakes; in Super Mario All-Stars, he is turquoise and orange, and a lighter shade of turquoise in Super Mario Advance. He was voiced by Charles Martinet in the latter game, owing to the addition of voice acting to the characters. Upon defeat in Super Mario Advance, Tryclyde can be heard shouting, "Impossible!" Tryclyde returns with the other bosses from Super Mario Bros. 2 in BS Super Mario USA. Like in the first game, Tryclyde serves as a mini-boss, and is fought in a similar way as in his battle from Super Mario Bros. 2. Tryclyde appears to have a lime green coloration in this game. Mario the zoo keeper think's he's one lucky fellow. After all, not many zoos in the world have such unusual creatures as Birdo, Tryclyde and Pidgit. Tryclyde in The Super Mario Bros. Super Show! Tryclyde (voiced by Harvey Atkin) is featured in several episodes of The Super Mario Bros. Super Show!, which depict him as being quite powerful, though somewhat unintelligent. Instead of working for Wart, he works for King Koopa as a member of his Koopa Pack, often appearing to help him, Mouser and Koopa Troopa in their plots. His middle head could talk, but he rarely did so. He most often battled Princess Toadstool, who was usually able to defeat him. In "The Great Gladiator Gig", Tryclyde assumes the alter-ego of "Tryclydius" to fit with King Koopa's Roman motif, and in "Koopa Klaus", he assumes the moniker of "Randolph the Red-Nosed Tryclyde", going with King Koopa's Santa Claus motif. Though Tryclyde never made a direct appearance in any issues of Nintendo Comics System, one of the comics' Dear Princess Toadstool features had him writing to Princess Toadstool in a thinly veiled attempt to get a date with her. In the letter, Tryclyde refers to himself using words such as "we" and "we're". In one of the bad endings of Pipe Down!, Ludwig von Koopa plays a mournful tune on a harmonica to summon Tryclyde to attack Mario and Luigi. Before the heroes can react, Tryclyde grabs them both by their rears, and drags them off to his lair. Tryclyde appears in volume 8 of Super Mario-Kun. Tryclyde's heads are given distinct personalities, and one even wears a pair of glasses. The two smaller heads are seen bickering while annoying the middle head. This bickering eventually helps them be defeated. Mario, Luigi, and Yoshi encounter Tryclyde in a pyramid. Tryclyde burns Mario and Yoshi, but Luigi has a Frog Suit. He gives Mario a Magical Potion. Tryclyde steals it from him, but drops it on Mario, enabling Mario to recover from a Mushroom. Mario then defeats Tryclyde by throwing Mushroom Blocks at him. Tryclyde has appeared as part of Wart's ultimate form during the fight. He appears to be jutting from Wart's head. "Do You Princess Toadstool Take This Koopa...?" "On Her Majesty's Sewer Service"
Gabucho From gaburi, biting sound. Official artwork only shows visible bottom teeth, yet in the game he has sharp, prominent upper teeth. He is also depicted with plain smooth skin rather than stripes. There are some unused sprites in Super Mario Advance of Cobrat with Tryclyde's palette. Presumably, if they were used, he would act like Fryguy and Clawgrip and start out as a regular enemy type before undergoing a transformation. In the Super Mario All-Stars and Super Mario Advance ports of the game, Tryclyde was recolored turquoise in the game, yet official artworks still depict him in red like the original NES version. ↑ Super Mario Bros. 2 instruction booklet, page 27. ↑ Yume Kōjō: Doki Doki Panic instruction booklet, page 36. This page was last edited on March 20, 2019, at 19:13.